Preheat the waffle iron. In a large bowl, whisk together the flour, baking powder, and salt. Stir in the eggs, milk, and melted butter. Mix until just combined. Stir in the chopped ham and cheese. Lightly spray the waffle iron with nonstick cooking spray, if desired. Pour about 3/4 cup of batter in the waffle iron and cook until crisp. Repeat with remaining batter until all has been used. 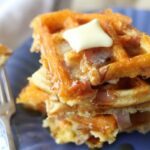 You can also keep the cooked waffles on a baking sheet in a warm oven to keep them warm until serving. Serve with syrup or even with a soft cooked egg on top.